It was a somewhat mixed week for US equity indexes, with net weekly changes ranging from +0.8% (Nasdaq comp'), +0.4% (sp'500), to -0.2% (Trans). Near term outlook offers around 3% of downside into early November. More broadly, the US market still looks bullish, at least into spring 2017. The sp' saw a trading range of just 24pts, settling +8pts (0.4%) at 2141. There is clear resistance around the soft psy' level of 2150, with a recent short term low of 2114. Ongoing price action remains leaning on the weaker side, and a break <2114 looks due. Underlying MACD (blue bar histogram) cycle ticked lower for a eleventh consecutive week. There is a viable 2-3 weeks lower, before cyclically, the market will be oversold. Best guess: breaking <2114, with significant weakness into early November to the 2080/70 zone. No sustained action under the 200dma seems viable, with renewed strength once the US election is out of the way. 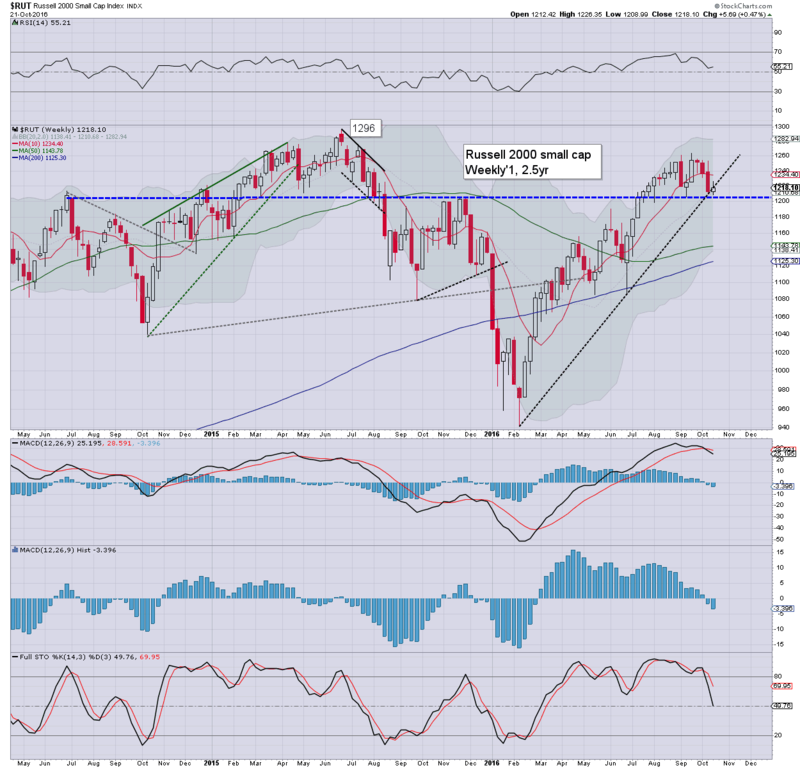 Equity bears should be careful about getting overly excited, unless a monthly close under the 10MA (currently 2080s). Only a few daily closes in the 2050s or lower would merit 'alarm bells', along with DXY >100. 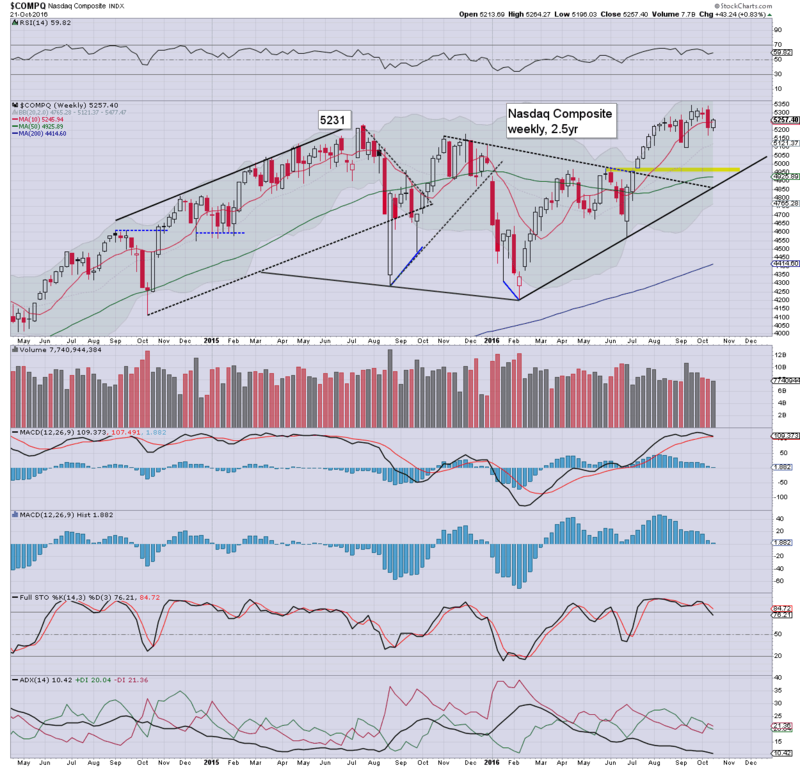 The Nasdaq continues to be the market leader, managing a net weekly gain of 0.8%, settling at 5257. Underlying MACD cycle is set to turn negative next week. First support is the giant psy' level of 5K. Things only turn bearish with sustained price action <5K in late November. 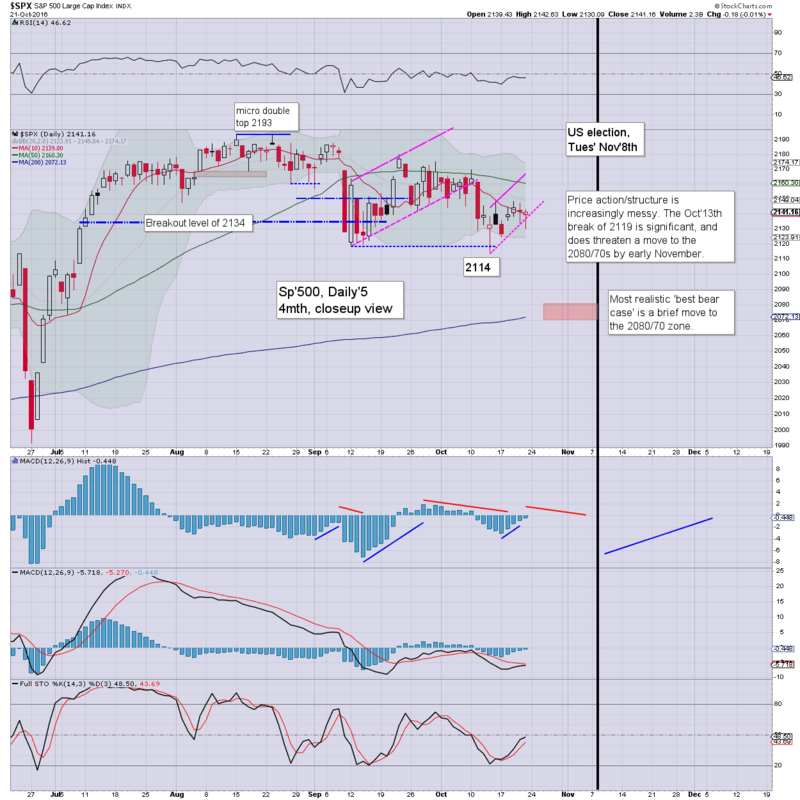 The mighty Dow was broadly flat on the week, settling @ 18145. Lower weekly bollinger is @ 17600, which is also where the 200dma is lurking. The 18k threshold remains a key level of support. Things only turn broadly bearish on a weekly close in the 17500s. The master index settled +0.5% @ 10571. 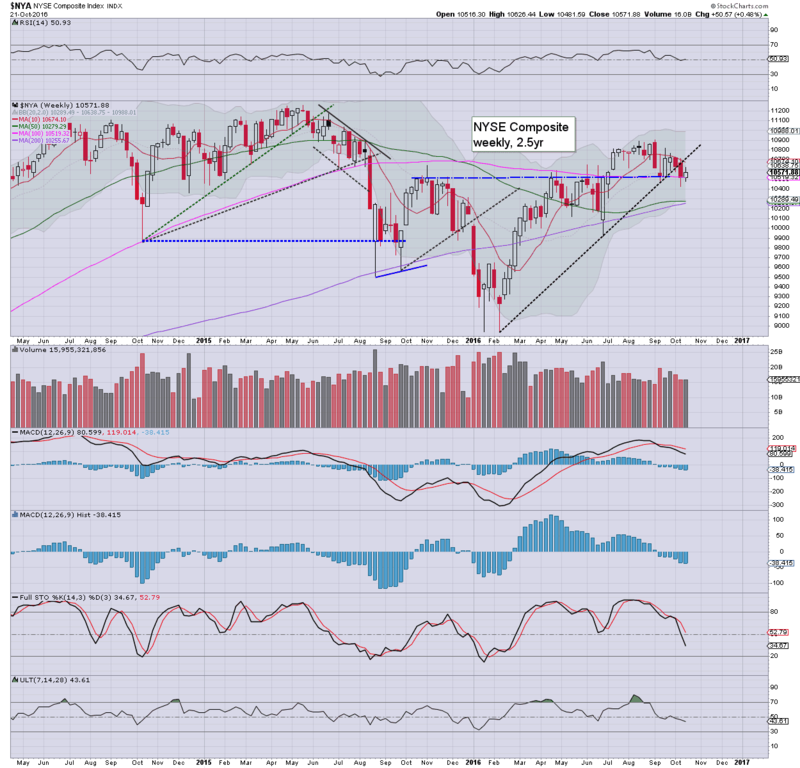 There is viable near term downside to the 10300s. Things only turn bearish with the 10100s. The second market leader - R2K, settled +0.5% @ 1218, notably holding the 1200 threshold. 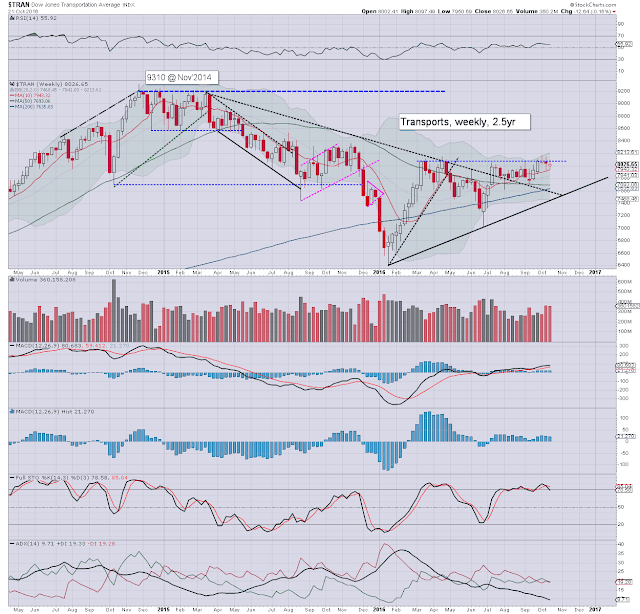 Despite the weekly gain, near term outlook is bearish, with viable downside to the 1160/50s. Alarm bells only sound with price action <1140. The 'old leader', remains the market laggard, and settled -0.2% @ 8026. Underlying MACD cycle remains net positive. 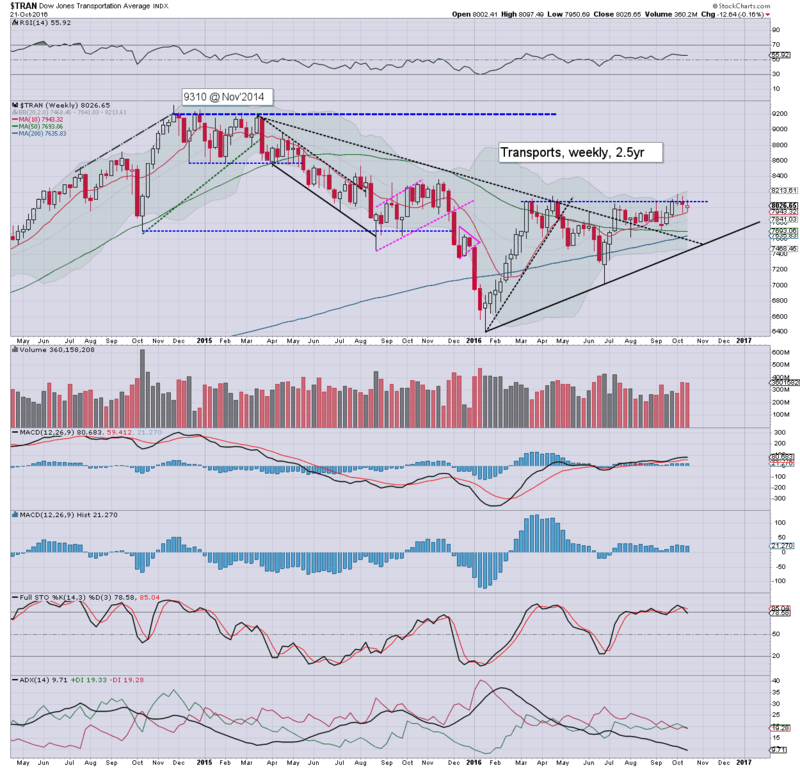 Near term outlook offers cooling to the 7700/600s. Things only turn broadly bearish with some daily closes in the 7500s. 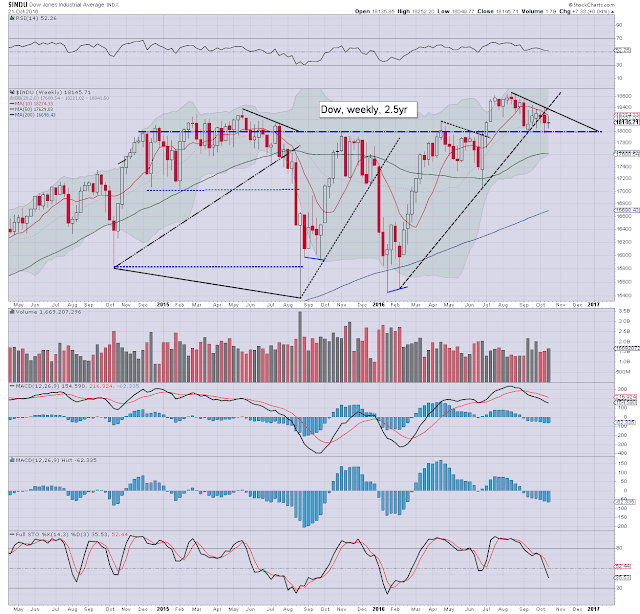 5 of 6 US indexes saw moderate net weekly gains. 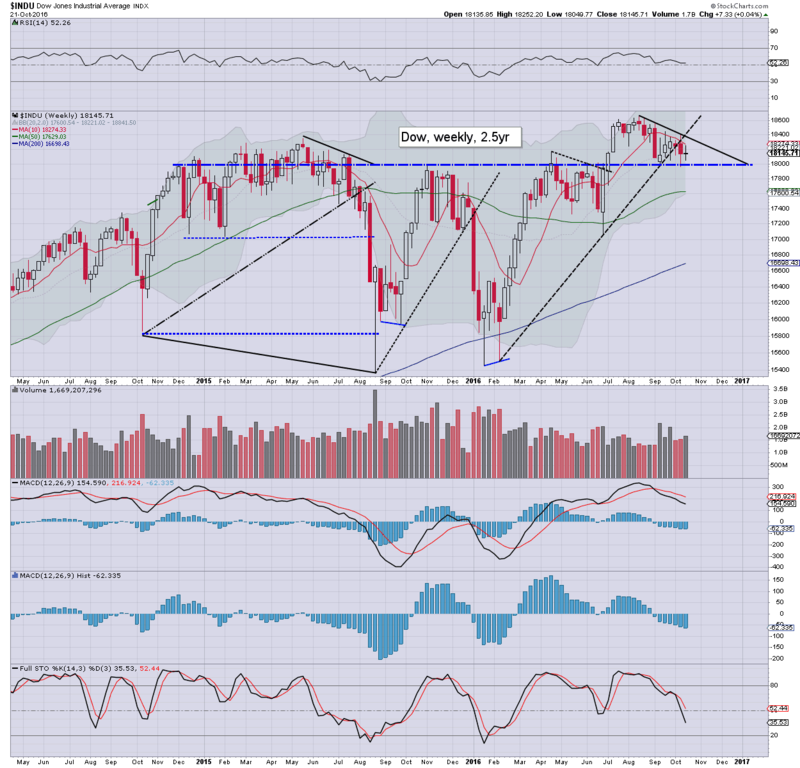 Most indexes continue to struggle since peaking in August - the exception being the Nasdaq (new high in mid Sept'). 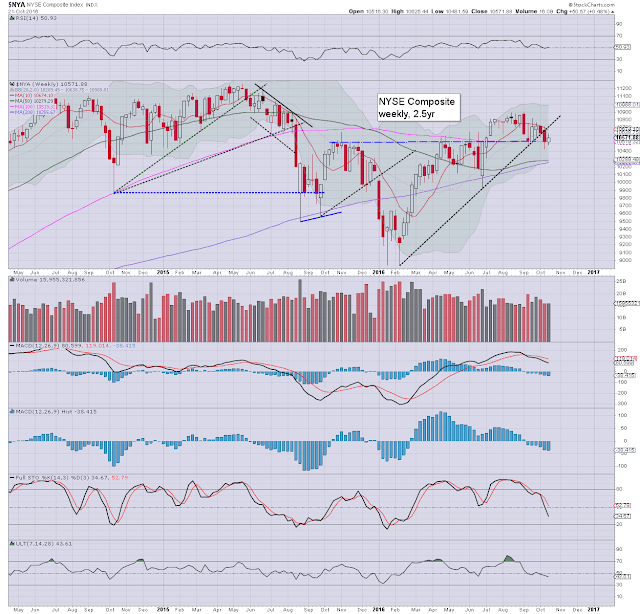 Price action remains choppy, but leaning weak. The bigger weekly cycles are offering around 3% of downside into early November. The coming week will see a monstrous amount of earnings, notably: CAT, AAPL (Tue), AMZN, GOOG, F (Thurs),and XOM (Fri). F - GDP (Q3), employment costs, consumer sent'. re: GDP, market consensus is for 2.5% growth. Considering other data points across July-Sept', that is arguably a little on the optimistic side. I'd not be surprised to see a first estimate near 2.0%. What should be clear, the US economy is not close to a recession, but neither it is doing great... its merely ticking along. *there are a few fed officials due on Mon/Tues, but none of the events look important. If you value these posts, then subscribe, which will give you access to my continuing intraday chatter at permabeardoomster.com. US equities closed a little weak, sp' u/c @ 2141 (intra low 2130). The two leaders - Trans/R2K, both settled -0.1%. 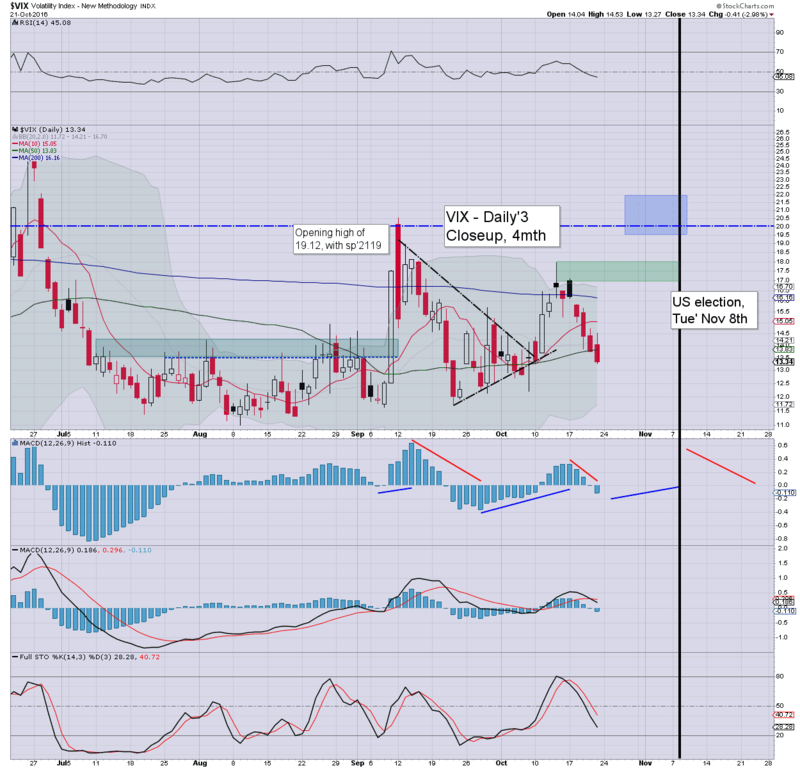 VIX settled -3.0% @ 13.34. 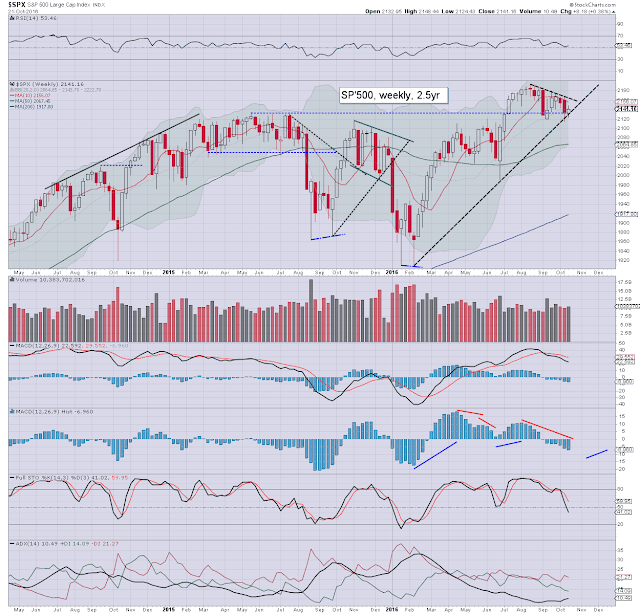 With a break of rising trend from the 2114 low, the door is wide open to a brief foray <sp'2100. The real issue is whether things spiral if the 200dma is broken under. Early morning weakness to sp'2130 was decisive enough to break rising trend from last week's low of 2114. 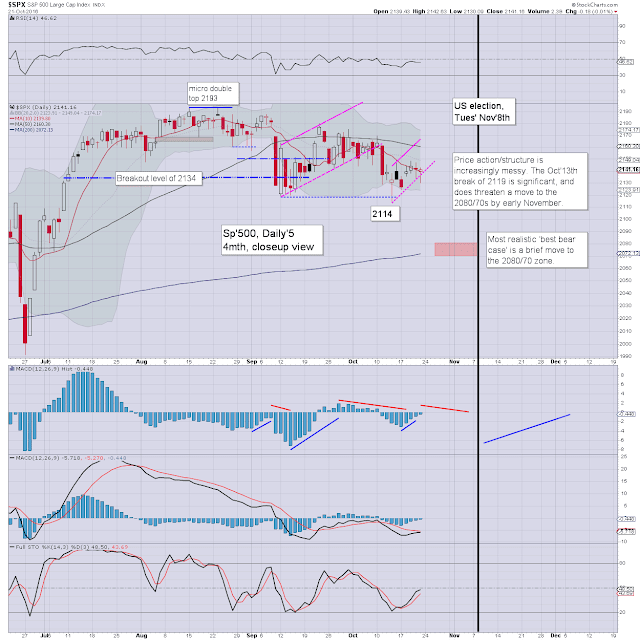 Further, it provisionally confirmed the bear flag. Despite equities leaning a little weak, the VIX was still unable to muster any upside, but then it was opex. The 15/16s look due next Mon/Tuesday. The key 20 threshold is due no later early November. A third consecutive net weekly gain for the USD. We're already close to the DXY 99s, and a break above the giant 100 threshold is now viable within the near term. 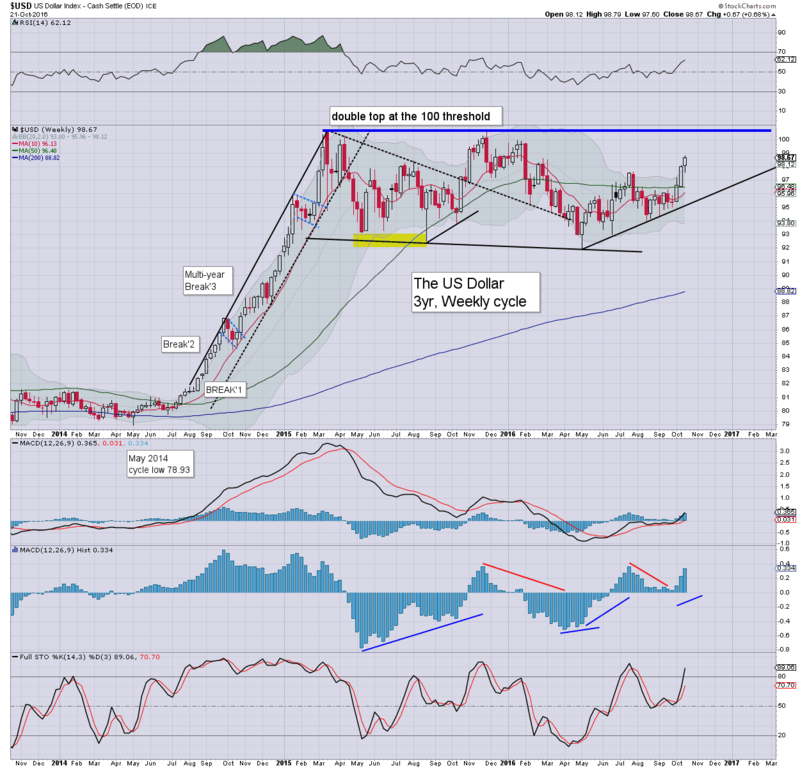 Unquestionably, the Fed do not want to see the USD break >100. Above 100, most should recognise that the next big level isn't until around 120, which would make for a powerful 20% appreciation against other currencies. Those equity bears seeking a major down wave should be flying the flag for a hyper-strong dollar. The USD is certainly not the only variable that will help shape the direction of the US/world capital markets, but its one of the biggest ones. *the weekend post will appear Sat' 12pm, and will detail the US weekly indexes.